Toilet lights are an affordable and quick way to add illumination to your bathroom to make late-night trips safer for everyone in your home. They provide an excellent way to prevent falls and support your aging in place as recommended by the National Council on Aging. Here, we’ve gone ahead and reviewed a few of the best options on the market today to make your buying choice simpler and more convenient. The seat is a novel way to add a nightlight to a room for hands-free operation. 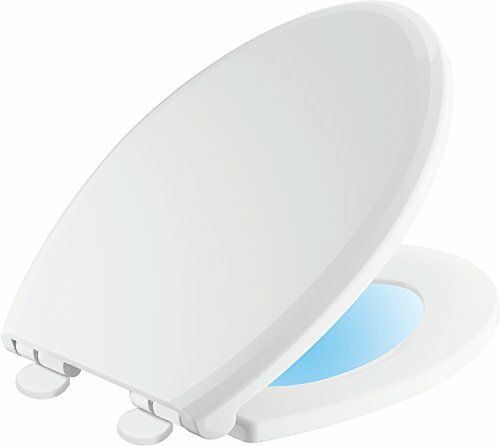 The Delta Faucet 813902-N-WH Sanborne Elongated Nightlight Toilet Seat is a unique take on assistive devices for performing everyday tasks. It is a standard model that you can get in either round or elongated versions. It also includes a battery pack in the bottom that powers a blue nightlight. The glow is soft and just bright enough to illuminate the room for nighttime trips. You set the 9/15 timer when you put the batteries into the seat. It then gives off continuous light until its on-cycle switches over. You don’t have to turn it on or get within a certain range to trigger it. It solves the issue of not enough light without any additional input. You can get a standard model or one with a slow-close lid. It’s a practical solution for seniors who need to lighten dark areas in their home quickly. These lights provide an affordable option for lighting dark areas in your home to reduce your risk of a fall. The Sycees SC01 Plug-in LED Night Light Lamp offers an excellent way to lighten dark areas in your home to help prevent falls for seniors who are at a higher risk. It operates on a sensor so that you don’t have to remember to set a timer. It’s a smart option for seniors who live alone without a caregiver. The LED lights last thousands of hours, so you won’t have to replace them. The lights give off a blue-white glow that resembles a gentle sunlight. It provides enough illumination while not overpowering a space. It turns on and off gradually for a smoother adjustment. They are unobtrusive and don’t interfere with the use of the other socket on the outlet. It’s an affordable solution that you can use throughout your home to make it safer at night and prevent trips and falls. The light is a flashy product that goes well beyond its purpose with sensors and technology. RECHARGEABLE DESIGN- Charging once can use about 2 month, No BATTERIES NO POLLUTION, more longer you use more money you saved. 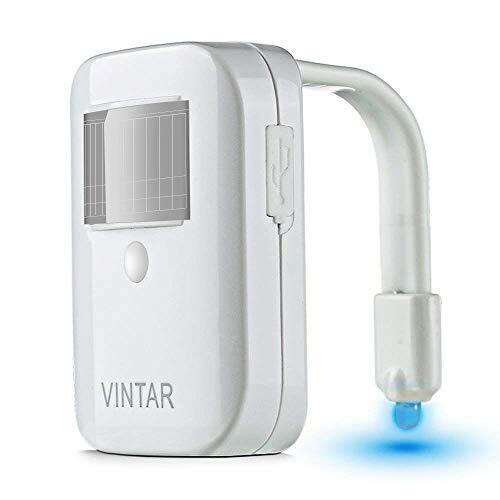 The Vintar Rechargeable LED Toilet Night Light uses a motion sensor to illuminate the room when you enter the area. As a night light, it’s functional and provides enough light to illuminate the entire space and prevent blind spots that could result in a fall or injury. You have your choice of colors or a carousel effect. The grandkids would probably enjoy this feature, but we thought it was fairly irrelevant in terms of overall safety. You can also set the brightness level to provide adequate light even in dark bathrooms. The light is rechargeable and includes a USB cable. It runs for about two months on a single charge. Seniors and caregivers will appreciate the red warning light that signals when the charge is running low so that they don’t need to set a manual reminder. Vintar’s night light also has a sensor for the ambient light in the room to save energy. We think this product provides an excellent way to ensure that night visits to the bathroom are safer. The light offers a value-priced way to add a colorful motion sensor light to your bathroom. 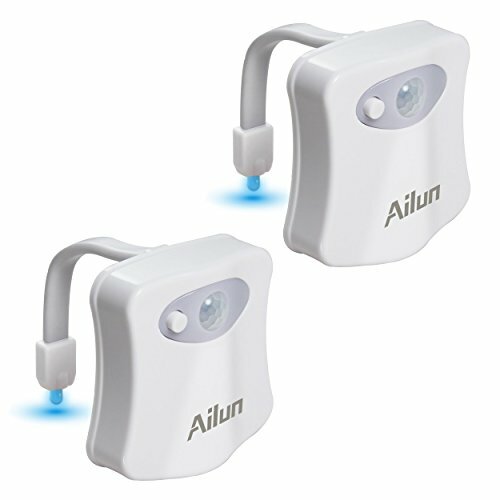 The Toilet Night Light by Ailun resembles the Vintar Rechargeable LED Toilet Night Light with some key differences. It hangs on the outside of the toilet with an adjustable fit to make sure it stays in place. It has eight instead of 16 colors. You can choose the one you want, or have it cycle through the rotation of choices. It uses a motion detector to turn on and will stay illuminated for two minutes after it stops sensing movement in the room. The fact that it stays on helps ensure that you can get back safely to your bedroom, making it an excellent option for seniors who live independently. This product uses three AAA batteries which are not included. It is also only water-resistant. It lacked a low battery warning too. Toilet bowl lights might not be the first thing you think of when it comes to improving the safety of your home. However, they can provide a valuable service and help prevent falls. Over three million seniors fall each year, and the bathroom is one of the most common locations. One of the best ways to avoid an injury to is to light dark spaces in your home. Therein lies the value of these products for older individuals and those with limited mobility. Toilet lights are only as good as their output. Both brightness and temperature play a role. The former is the amount of light a product gives off and determines whether or not it illuminates an area enough to be useful. LED lights, for example, are powerful even if there are only a few diodes in the unit. They are also a smart choice because of their long lifespan. Temperature also factors into the equation. You’ll find this information on the product description in degrees Kelvin. Products labeled 2000 to 3000 degrees Kelvin fall into the warm white range. Lights with 3100 to 4500 degrees Kelvin are cool white. Those with temperatures over 4500 degrees Kelvin replicate daylight and are the strongest. You’ll see toilet seat lights, LED lights, and other variations on this theme. By their nature, there exists a sanitary element. While those that hang on the side of the toilet are convenient, they also pose a health risk. Since seniors are more vulnerable to infections, it’s an essential consideration since the device requires frequent cleaning which may detract from their usefulness. Other options include simple LED lights that you can plug into an outlet or use with batteries. The advantage they offer is that you can place them exactly where you need them without the same concerns about sanitation. Many products use motion and light sensor technology that makes them even more convenient without the bother of setting a timer or flipping a switch. The power source is another essential specification to think about since it can affect the product’s practicality and cost of operation. Luckily, LED toilet lights are the ultimate in energy efficiency so that no matter how it runs, you’ll get the most for your money without having to worry about them going dead. They last for thousands of hours. We prefer toilet lights with a low battery warning indicator. Otherwise, the item loses its effectiveness as a light solution when you’re at a point where you need it most. That shortcoming undermines their value in the long run in those that don’t have this vital feature. The manufacturers often push the bounds of the technology that increase their efficiency and usefulness. The ability to adjust brightness levels is a welcome one so that you can match the output to what you need for a particular place to make them an excellent choice wherever you need to adjust the light to the situation to make your home safe. We love products that make things as simple as possible with sensors that do the heavy lifting and automate these tasks. They are a hands-free solution for aging in place whether you live alone or with a caregiver. 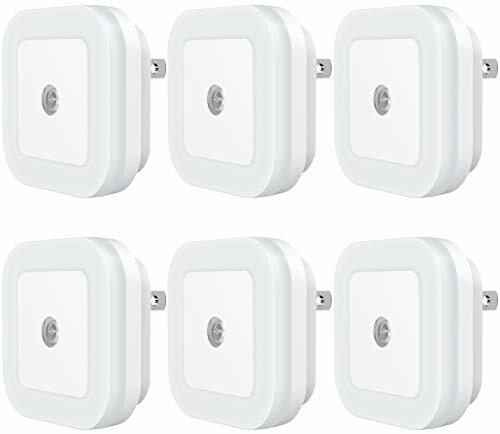 You needn’t worry about setting timers or remembering to activate them. Toilet lights offer a quick way to tackle a vexing problem and improve the safety of your home whether you’re a senior living alone or someone with limited mobility. It’s a win-win for you, your loved ones, and anyone who visits or provides in-home care too. And you have numerous options to shed some light on the situation.